Mallory-Weiss syndrome More Details (MWS) refers to an upper gastrointestinal (GI) bleeding disorder that occurs secondary to a sharp rise in intra-esophageal or intra-gastric pressure. Common inciting factors include episodes of severe vomiting, retching, or hiccups as in patients with alcoholism, bulimia, hiatus hernia, infectious gastritis or those receiving gastroscopy. The syndrome has been less commonly attributed to hyperemesis gravidarum in first trimester of pregnancy, and on rare occasions, it has occurred during third trimester or even postnatally. We report a case of Mallory-Weiss tear More Detailss diagnosed at 36 weeks gestation that manifested with dark tarry stools, hemorrhagic shock, and multi-organ failure. A 35-year-old woman, unbooked primipara with 36 weeks gestation presented to our emergency department with severe pre-eclampsia, complaint of severe dizziness and difficulty breathing for 10 days. She gave a history of loss of appetite and dark tarry stools for the same period. She also complained of excessive vomiting and retching during this period. Her antenatal history included pre-eclampsia (tablet labetalol 100 mg TID) started 2 months earlier as BP readings were 180/110 mmHg, gestational diabetes (human actrapid insulin), and hypothyroidism (tablet thyroxine 100 mg) all of which were well controlled with moderate doses of medications. There were no clinical and laboratory features of severe pre-eclampsia. She was found positive for sickle cell trait 2 months back and was put on aspirin 150 mg once daily for pre-eclampsia. During her antenatal visits, she was found to have iron deficiency anemia and was prescribed hematinics. Her last hemoglobin before this admission was 9.2 gm/dl. At the time of this admission, her blood pressure was 100/70 mmHg, pulse rate was 140 beats/min, and oxygen saturation was 95%. Laboratory examinations revealed a sudden drop in hemoglobin from 9.2 to 3.9 gm/dl. Serum creatinine was found to be 2.9 mg/dl with a blood urea of 80 mg/dl. Coagulation profile was normal. Two units of packed red blood cells were transfused, and an infusion of proton pump inhibitor was started. Parenteral iron supplements were also started. After initial stabilization, an upper GI endoscopy was done, which showed Mallory-Weiss tears in the healing phase [Figure 1]. The patient was kept under observation for few days to rule out any further episodes of bleeding. Her melena improved, creatinine decreased from 2.9 to 2.0, and hemoglobin rose to 6.2 gm/dl. Tests done to rule out connective tissue disorders were borderline positive for ds DNA, ssB, and antinucleosomes. Emergency section was performed under neuraxial block for non-reactive non-stress test (NST) and presumed fetal compromise after 3 days. She had an uneventful surgery with minimal blood loss of 300 ml intraoperatively. She was transfused two more units of packed red blood cells in the postoperative period to correct her pre-existing anemia. Her hemoglobin increased to 8 gm/dl and her serum creatinine came as 1.9. She was discharged home after 3 days. MWS is the clinical sequelae of longitudinal tears of the esophageal wall usually at the gastro-esophageal junction, which may affect only the esophageal mucosa or penetrate through the entire esophageal wall. MWS reflects 3%–15% of all the cases of upper GI hemorrhage. The exact incidence of this syndrome in pregnancy is not known. It was first described in 1929 by George Kenneth Mallory, an American pathologist and Soma Weiss, an American physician in patients with persistent retching and alcoholic binge. Clinically, MWS may occur in any individual with severe bouts of retching, coughing or vomiting or after any event that provokes a sudden rise in the intra-gastric pressure. Commonly, the patients present with dyspepsia, abdominal pain, hematemesis, melena, back pain, and in some instances, with features of hemorrhagic shock. Hematemesis is the most common presenting feature, whereas melena, hematochezia, syncope, and abdominal pain are less common. Knauer CM has reported a significant number of instances where salicylate ingestion is linked to Mallory-Weiss tears, attributing to approximately, 30% cases of MWS. 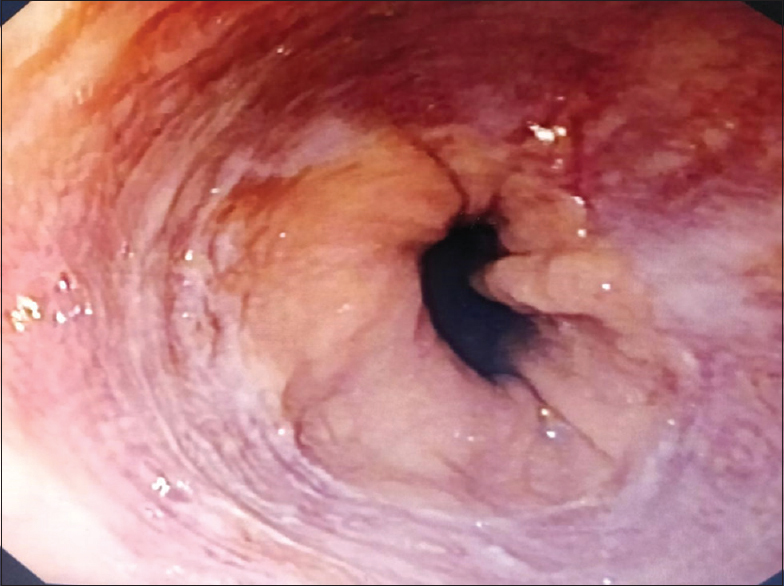 In most of the patients, the bleeding subsides with conservative management but 5%–35% patients may need endoscopic therapy such as hemoclipping, thermocoagulation, balloon tamponade, or diluted epinephrine injection. The presence of shock at initial presentation and active bleeding are independent risk factors for predicting recurrent bleeding in patients with this syndrome. If there are no contraindications, a central neuraxial block is the ideal anesthetic technique in these patients and it confers good hemodynamics stability. Epidural analgesia should be offered to laboring women, and active bearing down efforts should be avoided. Second stage of labor should be cut short with assisted vaginal delivery. For all patients who require general anesthesia for cesarean or non-obstetric surgery, they should be considered full stomach and must be given adequate acid aspiration prophylaxis. Induction and extubation should be conducted as per the standard protocol. Rapid sequence induction should be the rule. Further, it is of paramount importance to suppress the laryngo sympathetic response during intubation and extubation. Several studies have advocated the use of dexmedetomidine, an alpha-2 agonist, to achieve hemodynamic stability and suppress the pressor response seen at intubation and extubation. We should always be prepared for urgent perioperative blood transfusions and emergency endoscopic hemostasis in these patients if the need arises. Acid aspiration prophylaxis should be continued in the postoperative period also. We postulate that in our case, the cause of Mallory-Weiss tears was pregnancy induced retching and vomiting secondary to pre-eclampsia, compounded by aspirin 150 mg once a day that was started in view of pre-eclampsia. This led to melena, severe anemia, and hypotension with hemodynamic instability and acute kidney injury. Further, as systemic lupus erythematosus (SLE) profile was borderline positive, she would again need a repeat screening after 12 weeks. Whether she had acute on chronic kidney insufficiency also needs follow-up, though radiologically, there were no features of chronic kidney disease. Upper GI endoscopy has a diagnostic accuracy of greater than 90%. Bleeding from the tears usually stops spontaneously and healing occurs with conservative treatment in most patients. Hence, endoscopy should be done whenever there is unexplained drop in hemoglobin, especially, when stool for occult blood is positive or has history suggesting gastro-intenstinal (GI) bleeding to minimize near misses that sometimes can prove fatal. We present a very rare case report of MWS in pregnancy, a rare near miss. One should suspect and have a low threshold for upper GI endoscopy, when a pregnant patient presents with severe vomiting with clinically apparent GI bleed, melena, or unexplained acute anemia. All authors contributed to the concept and intellectual content, literature review, data acquisition and analysis, and manuscript preparation, review, and editing. The manuscript has been read by all authors and each author believes the manuscript represents honest work. Ansari P, Stunkard A. The Merck Manual of Medicine. 19th rev. ed. Whitehouse Station (NJ): Merck and Co., Inc.; 2011. p. 99-127, 1536-7. Mallory GK, Weiss S. Hemorrhages from lacerations of the cardiac orifice of the stomach due to vomiting. Am J Med Sci 1929;178:506-14. Parva M, Finnegan M, Keiter C, Mercogliano G, Perez C. Mallory-Weiss tear diagnosed in the immediate postpartum period: A case report. J Obstet Gynaecol Can 2009;31:740-3. Sugawa C, Benishek D, Walt AJ. Mallory-Weiss syndrome. A study of 224 patients. Am J Surg 1983;145:30-3. Cappell MS. Esophageal bleeding after percutaneous endoscopic gastrostomy.J Clin Gastroenterol 1998;10:383-5. Kortas DY, Haas LS, Simpson WG, Nickl NJ, Gates LK Jr. Mallory-Weiss tear: Predisposing factors and predictors of a complicated course. Am J Gastroenterol 2001;96:2863-65. Knauer CM. Mallory-Weiss syndrome. Characterization of 75 Mallory-Weiss lacerations in 528 patients with upper gastrointestinal hemorrhage. Gastroenterology 1976;71:5-8. Kim JW, Kim HS, Byun JW, Won CS, Jee MG, Park YS, et al. Predictive factors of recurrent bleeding in Mallory-Weiss syndrome. Korean J Gastroenterol 2005;46:449-54. Cho KH, Heo SW, Chung SH, Kim CG, Kim HG, Choe JY. A case of Mallory-Weiss syndrome complicating pregnancy in a patient with scleroderma. Korean J Intern Med 2003;18:238-40. Douvres PA, Rosenthal WS, Metzger P, Tchertkoff V. Acute fatty liver of pregnancy with hepatic coma and Mallory-Weiss Syndrome: Report of a case. Am J Dig Dis 1965;10:306-13. Mushambi MC, Kinsella SM, Popat M, Swales H, Ramaswamy KK, Wnton AL, et al. Obstetric anaesthetists' association and difficult airway society guidelines for the management of difficult and failed tracheal intubation in obstetrics. Anesthesia 2015;70:1286-306. EL-Tehan MR, Mowafi HA, AL Sheikh IH, Khidr AM, AL- Juhaiman RA. Efficacy of dexmedetomidinein suppressing cardiovascular and hormonal responses to general anaesthesia for caesarean delivery, a dose response study. Int J Obstet Anesth 2012;21:222-9. Suzuki T, Wagata M, Konno H, Ito T, Torii Y, Murakoshi T. Case with a nonreassuring fetal status induced by massive hematemesis due to Mallory-Weiss tear that requied emergency cesarean section at 38 weeks' gestation. Case Rep Obstet Gynecol 2015;2015:762463. Church NI, Palmer KR. Ulcers and nonvariceal bleeding. Endoscopy 2003;35:22-6.